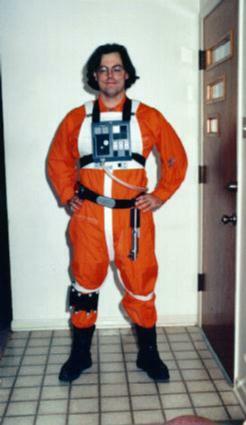 X-Wing Fighter Outfit: I don't believe they teach Grinning 101 at the Academy. Nevertheless, the outfit is quite cool. I don't know what materials he used to do it, but Jeff also makes lightsabers just like the one shown here on his belt. He must have been too busy being photogenic to remember to borrow a flight helmet.